"Postcards from Apple Land: 21 Dog-Years and Counting. Virtually." I originally wrote this post in 2009 as part of an introduction to behaviors for Expression Blend. Despite “rebooting” my site, it continues to be one of the most referenced articles so I’m resurrecting it for posterity. ehaviors, which implement a mechanism for wrapping control functionality into reusable blocks, were introduced in Expression Blend 3. They're not a new concept; packaging control event handlers in a separate, reusable class has been possible since .Net was first introduced. What is new is the seamless integration with a Visual Designer (in this case, Expression Blend). Behaviors enable a truly great design-time experience when applying custom functionality to UI controls. Something that, until now, has required an unwieldy amount of custom code. 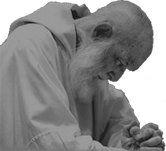 You can just Trust the Monk with the pre-compiled DLLs. depending on your project type. 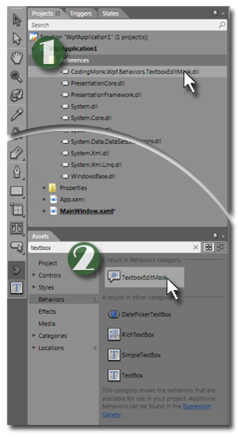 Step two: Drag the behavior from your "Assets" pane and drop it on to a control (in this case, a TextBox control). This creates an instance of the behavior and applies it to the control. The first, EditMask, holds the pattern to be enforced. This mask should conform to the CodingMonk Edit Mask notation (version 1.1). The notation is relatively easy to learn, especially if you've had experience with more exhaustive notations such as Regular Expressions. The second parameter, MatchCaseToMask, is a checkbox. This is off by default, rendering the edit mask case-insensitive. This means when a letter appears in an edit mask, either the upper or lowercase version of that letter is allowed. If the pattern calls for the capitol letter "A", the lowercase "a" would also be accepted and displayed as lowercase. Checking this box causes the text to conform to the case of the pattern. In this example, the lowercase "a" would still be allowed as input, but it would be rendered in uppercase in the textbox. These effect what is displayed when backspaces and deletes occur. 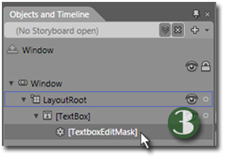 Since edit masks are typically fixed width, the backspace and delete keys have the effect of replacing the next and previous character. 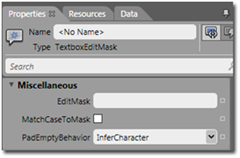 InferCharacter, the default, makes a decision based on allowable characters in the pattern. The alternative, UseUnderscore, simply enforces an underscore for character positions not yet filled in. Don't be surprised if users find your app unintuitive.